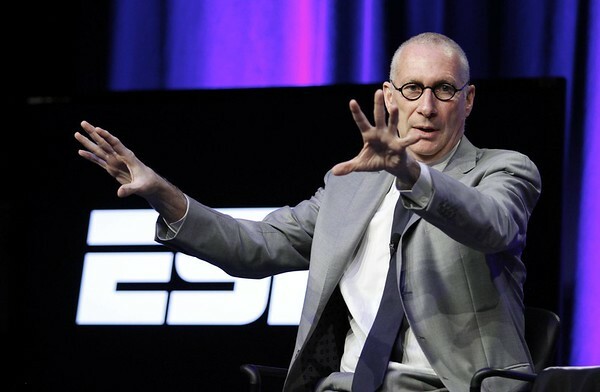 BRISTOL - John Skipper resigned from his position as ESPN’s president on Monday, citing substance abuse issues as his reasoning for the decision. Skipper, who made the announcement through an email to the sports network’s employees, which was later made public, admitted that he has been struggling with substance addiction for many years, and said it’s time for him to take care of his problem. “I have disclosed that decision to the company, and we mutually agreed that it was appropriate that I resign,” Skipper, who also served as co-chairman of Disney Media Networks, wrote in the email. Former ESPN President and Executive Chairman George Bodenheimer will serve as acting chair of the company for the next 90 days, overseeing the transition process, the sports network indicated in a statement. Bodenheimer worked at ESPN from 1981 to 2014. Bob Iger, chairman and CEO of Walt Disney Co., ESPN’s parent company, issued a statement Monday about Skipper’s decision. Iger said he plans on working with Bodenheimer to find Skipper’s successor. Skipper joined ESPN in 1997 and had served as executive vice president of content before he was named president of the network on Jan. 1, 2012. Prior to his time with Bristol-based ESPN, Skipper worked for Rolling Stone magazine and Us, which now goes by Us Weekly. An ESPN spokesperson on Monday declined to comment further on Skipper’s departure, saying the information that was released in a series of statements was all that network officials were willing to discuss. Skipper’s announcement shocked network employees and drew support and concern from many of them. Dan Le Batard, who has a daily talk show on ESPN Radio, learned of Skipper’s decision while he was on the air. He fought back tears while expressing his concern for the 61-year-old’s well being, and praised what he did for the company. Jemele Hill, co-host of ESPN’s flagship program “SportsCenter,” also expressed her support of Skipper. She was suspended by Skipper in October for her tweets disparaging President Donald Trump, but she clarified that she was never mad at the sports network executive for her suspension. Bodenheimer also issued a statement Monday. Posted in New Britain Herald, Business, General News on Monday, 18 December 2017 22:49. Updated: Monday, 18 December 2017 22:51.